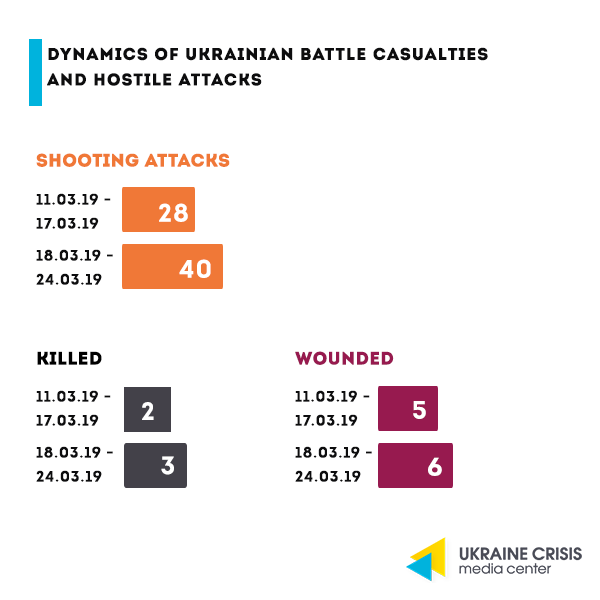 On March 20 Russia-backed militants fired from Minsk-proscribed 82-mm and 120-mm mortars 10 times having launched a total of 74 mortar rounds. Russia’s proxies also fired upon the Ukrainian troops with an antitank missile system having launched five guided missiles. They also fired from the weapons mounted on infantry fighting vehicles as well as from grenade launchers, heavy machine guns, sniper rifles and small arms. One week ahead of the voting 25-35 per cent of Ukrainians have not made up their mind yet as to the candidate they choose at the presidential elections. 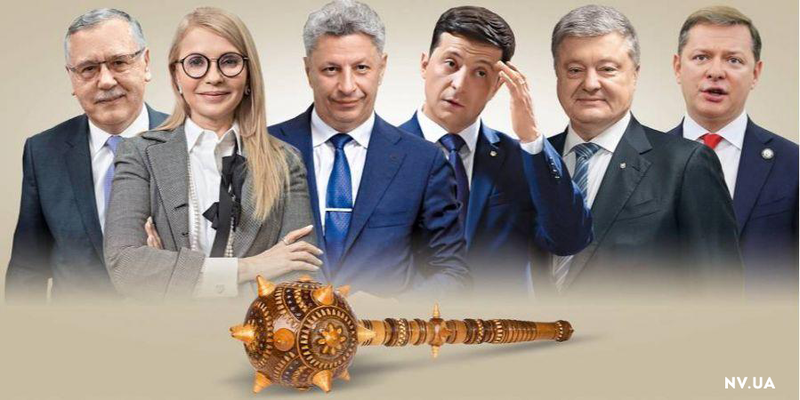 Ukrainian media “Novoe Vremya” asked each of the six most popular candidates for president seven questions that go beyond politics and economics. They all answered (but Yuriy Boiko who was probably busy getting ready to his Moscow trip). “Novoe Vremya” is the only media that succeeded to get all the candidates to answer. UCMC quotes the answers of the top three candidates to the top three questions. What are the three key things that you will do as the President if elected? Volodymyr Zelenskyi: Ceasefire in Donbas. Diplomatic negotiations in the Budapest format including the US and the UK. NATO-standard army. A referendum on NATO membership. Strong economy. Fight against corruption. Cement concrete road surfaces. Petro Poroshenko: Obtaining the NATO Membership Action Plan. Implement my program of eradicating poverty. Regain Ukraine’s sovereignty over the occupied Donbas and Crimea. Yulia Tymoshenko:Make Ukraine happy. It is in happiness that we can “implant” the GDP, the level of the salaries and justice. A political leader that inspires you. Zelenskyi: Lee Kuan Yew who was the First Prime Minister of Singapore. Tymoshenko:Churchill, Roosevelt, de Gaulle, Margaret Thatcher, Angela Merkel and Lee Kuan Yew. Which compromises do you consider acceptable to regain control over Crimea and Donbas? Zelenskyi: Cultural and language peculiarities of these regions. Poroshenko:Neither Ukraine’s territorial integrity, nor its course towards European integration and NATO cemented in the Constitution, nor the unitary system of government can be subject to negotiations. There can be no compromises as to Crimea’s status. Crimea is Ukraine. Tymoshenko:Crimea and Donbas are Ukraine, no nuances or options are acceptable. We need true peace on Ukraine’s terms. The Prime Minister of the Russian Federation Dmitriy Medvedev had a meeting in Moscow with Yuriy Boyko, a candidate for president, and with Viktor Medvedchuk. Boyko claims he was advocating the interests of Ukraine and Ukrainians, and that the meeting was on gas. The candidate reassured that the meeting was crucial. They discussed hands-on economic issues accumulated over the past five years. Gas-related issues.Gazprom head Alexey Miller also took part in the meeting. Medvedev said that the “deep crisis” in the bilateral relations between Ukraine and Russia made the meeting indispensable. Medvedchuk claimed that “in Ukraine the tariffs increased by 745 per cent over the past five years, gas prices – by 1080 per cent, heating costs – by 1220 per cent”, so there is a need for direct gas supplies from Russia, he said. Alexey Miller said Gazprom is ready to negotiate a contract on direct supply of Russian gas to Ukraine. Miller said the new contract will make the price for individual households in Ukraine a quarter cheaper than the actual one. Medvedchuk said the gas price for Ukraine may constitute USD 240-260 per 1,000 cubic meters. Ukraine’s reaction.Naftogaz Ukraine NJSC said they have bought natural gas this March from the EU paying USD 226 per 1,000 cubic meters, a price 6-13 per cent lower than what Medvedchuk wished for. Reaction of the actual President. Petro Poroshenko condemned the visit of Yuriy Boyko and Viktor Medvedchuk to Russia and the meeting they had with Medvedev and the Gazprom chief. President Poroshenko said that representatives of one political force went to Russia, while representatives of other political forces are ready to kneel in Ukraine before the Russian president. Poroshenko added that for Putin the victory at the military front failed, so he wants to change Ukraine from inside by changing its authorities. Reaction of Ukraine’s Security Service.The Security Service said they will shortly provide a legal evaluation within their area of responsibility of the visit that Boyko and Medvedchuk made to one of the leaders of the aggressor state as well as of the statements they made. Payments on the gross external debt.In 2019 Ukraine’s payments on the gross external debt will amount to USD 15.7 billion, reports the National Bank of Ukraine. According to the Bank, Ukraine will pay USD 5,609 billion on the gross external debt between January and March, USD 4,28 billion is to be paid in principal. In the second and third quarters the amount due to be paid will decrease to USD 3,608 billion and USD 3,919 billion respectively. The fourth quarter will see the payment further decrease to USD 2,519 billion and USD 1,853 billion in principal. GDP.In 2018 Ukraine’s real GDP increased by 3,3 per cent, in 2017 – by 2,5 per cent and in 2016 – by 2,4 per cent, the State Statistics Service of Ukraine reported. Nominal GDP amounted to UAH 3 trillion and 558,7 billion (approx. USD 132,1 billion) making it UAH 84,19 thousand (approx. USD 3,13 thousand) per capita, the GDP deflator changed by 5,4 per cent. The State Statistics Service also recorded a better increase of the GDP in the fourth quarter of 2018 – 3,5 per cent compared to 3,4 per cent in 2017. Economic growth forecast.According to the National Bank’s forecast, in 2019 economic growth in Ukraine will temporarily slow down by 2,5 per cent. The major factors constraining the growth will be tight monetary policy exercised to bring the inflation back to the mid-term target of five per cent +/- 1 pp, as well as tight fiscal policy resulting from significant repayments on external debt. “Domestic demand – both personal consumption and business investment, will stay the main driving force behind the GDP growth,” the National Bank stated.